The book revolves around a man named Edward Caine who is insanely in love with his wife - I mean, completely adores and cherishes her. And then, the unthinkable happens - she is raped and murdered by a serial killer. That is when Edward's life spins out of control and he comes to this conclusion: 98% of the human population will just live and die on Earth - never really contributing anything while here. 1% will be the geniuses of the world - scientists, engineers - people who will impact and change society. And it is because of this 1% that "survival of the fittest" no longer exists. Because of vaccines, and money, people who would've typically died, are now outlasting all of us. So in comes the final One Percenters. They're job is to rid the world of the dead weight - of the people who will never contribute anything to this world. To kill those who bring down humanity. How cool is this idea?! I thought this novel was unique, original and totally believable. 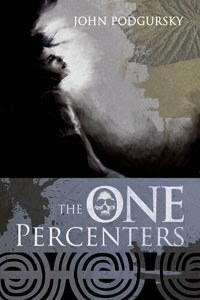 I actually found myself wondering whether the One Percenters actually exist, and kinda wishing they did. It's this idea, and the way it is cleverly written by Podgursky that makes me give this book 4 stars. Unfortunately, I had to take off one star for the ending - which I don't want to give away on the blog. But I'd love to know if you think I'm right...did this book deserve 5 stars? Buy it, read it, and let me know what you think!! It definitely sounds interesting. Reminds me of the Dexter series by Jeff Lindsay. Dexter Morgan would definitely be a "one percenter."